Following record-breaking Filipino tourist arrivals in Israel in 2017, Israel’s Ministry of Tourism last April held its first roadshow in the Philippines. 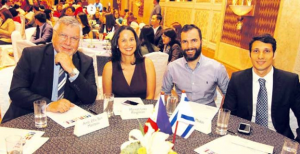 The event took place in two cities – Manila on April 24 and Cebu City on April 26 – and featured companies from Israel and notable figures in the Israeli-Philippine community who promoted tourism for both countries. According to the Philippines’ Department of Tourism, Filipino tourist arrivals in Israel achieved a 61 percent growth in 2017, with 23,500 Filipinos visiting the Holy Land. In the same year, 17,446 Israelis visited the Philippines. The Ministry of Tourism predicts that the number of Filipino tourists in Israel will rise to 30,000 in 2018. Its campaign to increase Filipino visitor arrivals further was one of the main topics during the roadshow. The Ministry conducted the roadshow in a networking format. It featured over 100 local travel agents. Hassan Madah, Ministry of Tourism Director for India and the Philippines, said they held the event to “tap new markets” and promote Israel as an emerging destination for Filipino travelers. The roadshow was attended by (l-r) Ambassador of Israel to the Philippines Effie Ben Matityau, Filipina actress Maricel Laxa-Pangilinan, ICCP President Itamar Gero, and Israel Ministry of Tourism Director for India and the Philippines Hassan Madah. The Ministry of Tourism is working with Philippine Airlines to create direct flights to and from Israel to improve both countries’ accessibility and increase business and leisure opportunities. Madah said this may happen by the end of the year. Unknown to many Philippine passport holders, they are allowed to stay in Israel for up to 90 days as long as they meet certain requirements, such as passport validity, confirmed roundtrip tickets and hotel reservations, enough pocket money, and a letter from a sponsoring establishment or tourist agency. Thanks to the Israel-Philippines cooperation, which began as early as the 1930s, both countries have enjoyed a symbiotic relationship that has helped both their tourism and economies.